Now you try to NOT sing that song all day! 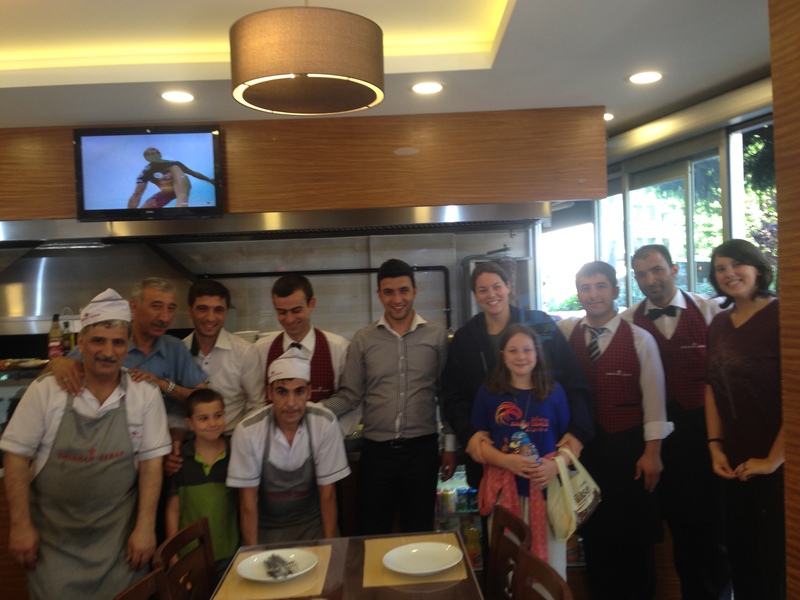 Things really started to take a turn for the better when we got to Istanbul. The weather was the best part (not really but it’s a good place to start). It was sweater weather! Of course, not true summer weather, just a week long fluke, but for us it was a Godsend! It was so nice to walk around in pants because the weather was cool. We rented a little two bedroom condo that was below street level keeping it extra cool. Come to find out, picking blindly was the best thing we ever did. We ended up in the perfect location for a week in Istanbul. It was so perfect that we didn’t even venture out of our neighborhood! It was located in a very non touristy part of the city where there were mom and pop markets on the corner and bread stores everywhere. It was a short walk to shopping and coffee shops and yummy restaurants….it was heavenly. Here is a picture of our first meal out. 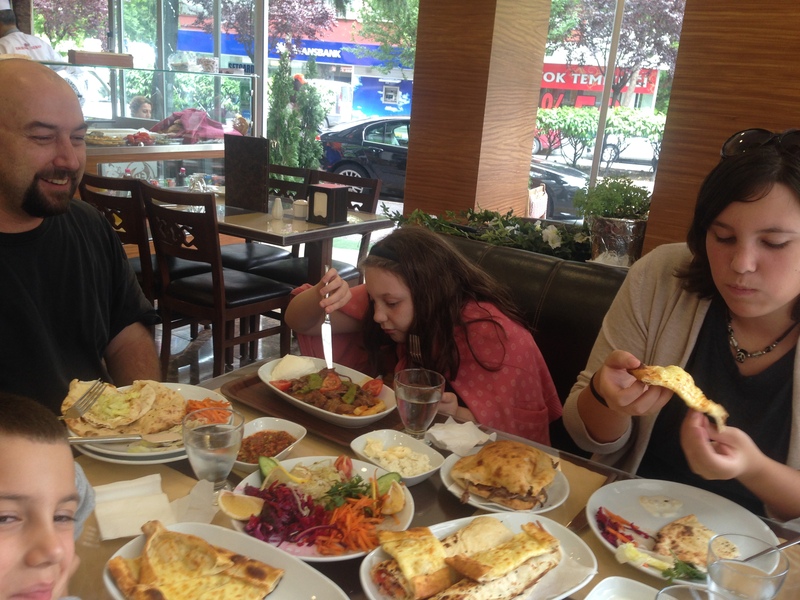 I can’t even tell you what we had….kebabs I think and it was served with bread and veggies and dips…I miss it already! 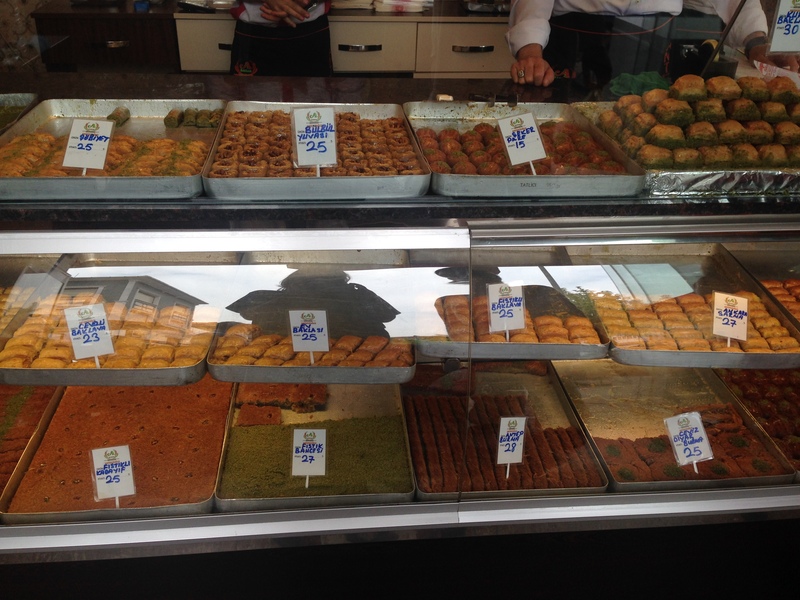 Then, of course, we had to stop and try some baklava. Who knew there were so many varieties?! 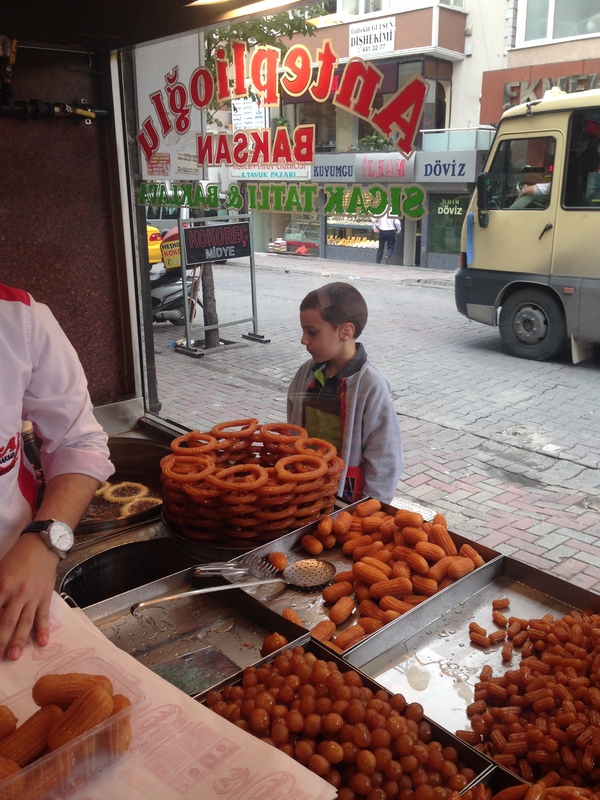 In the shop we stopped at, they also made these sweet sticky donut things called tulumba tatlisi. It means fried pastry with syrup (I think). Sy was very interested in watching how they were made so of course we had to try some. The kids liked them but I thought the texture was weird…kinda crunchy and sticky sweet but smushy in the middle. 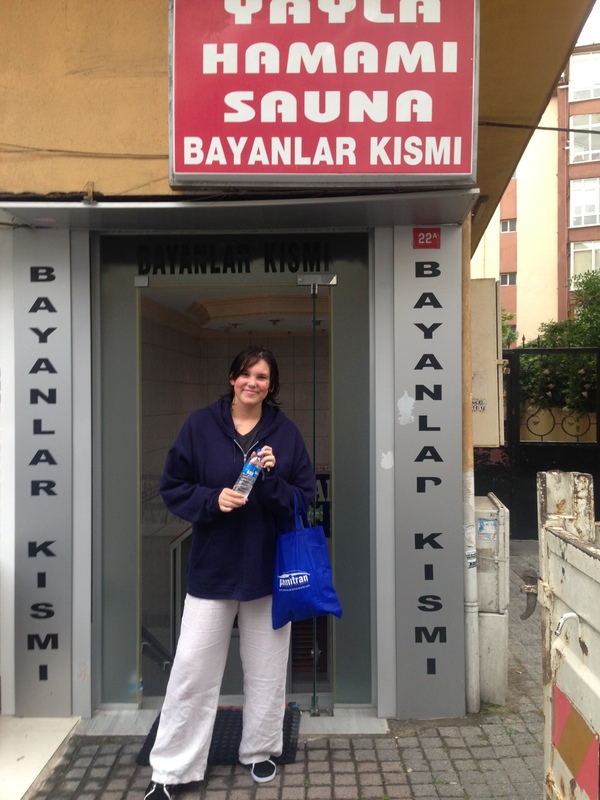 It wouldn’t have been a trip to Turkey without a morning at the turkish baths! I convinced Grace to go with me and she ultimately agreed that it was a great experience. I won’t go in to details and obviously won’t be sharing any photos. But trust me when I say that if you are given the chance to visit one, you should go. And if you’re lucky and are ever able to have a coffee with Grace and I then feel free to ask about our experience! It was a hoot! 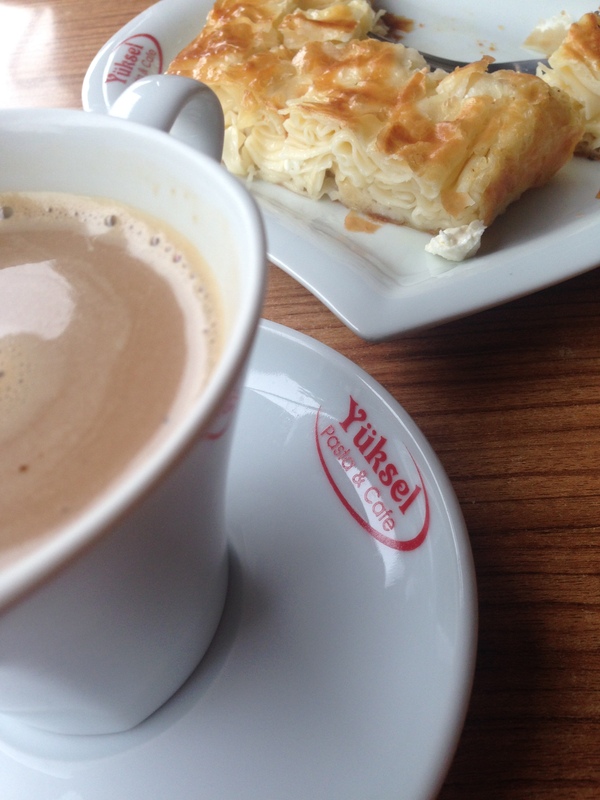 After our bath we stopped at Yuksel Cafe and Pastane, our favorite local coffee and pastry shop for a snack. We tried something new called Borek. It’s a flaky pastry filled with layers and layers of phyllo I think…it tasted almost like a pasta with cheese and butter. And of course our coffee…. Here’s a photo of Grace and Daddy enjoying a meal 🙂 And last but not least, we asked our servers and cooks at our favorite local place for a photo and they ALL stopped and ran over so we could snap one! It was awesome!! We stayed in a vacation rental in Bahçelievler. 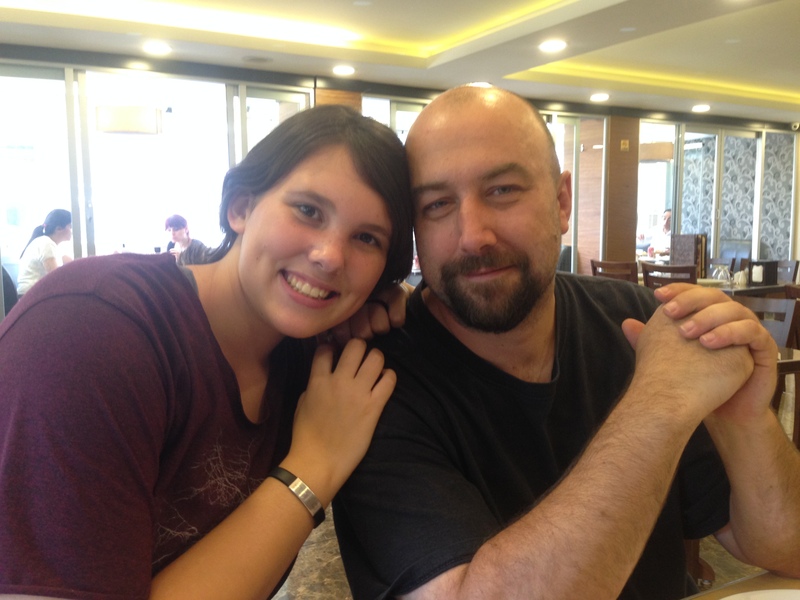 If you’re going to Istanbul and are interested, we can put you in touch with the lady we rented from…she was a great hostess! Stay tuned for the next post….the market day made me want to move there! Previous PostMy take on BaliNext PostThe best fresh market ever! What a great post! The pictures are amazing, and the food photos made me hungry! Yum! Love the picture of Grace and Daddy~ Just too sweet!